Sylvanas destroyed Teldrassil last week in a controversial moment in World of Warcraft’s geopolitics, and I asked you to find me a new culprit for this video game bad thing. It’s hard to believe that this war that’s been running for more than a decade is getting stale, but here we are, and it seems that the only tools left in the ole MMO narrative chest are “heinous warcrimes.” Could Sylvanas Windrunner, leader of the Horde, actually do something so awful like burning down a capital city of the opposing faction? Something else had to be involved. Our winner this week is El Comentarista, who paints a truly disturbing picture. 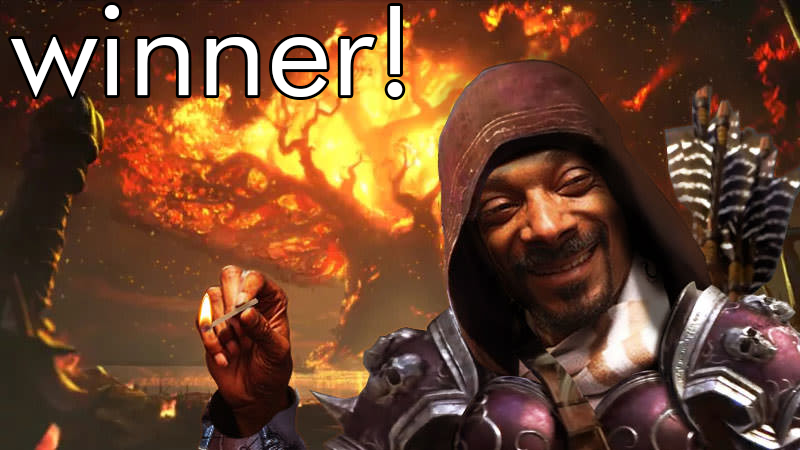 Snoop Dogg aka Snoop Doggy Dogg aka The Doggfather, so high that he has transcended our world and landed on Azeroth, became the leader of the Horde, got even more high, and then burned down the big tree. I cannot believe that America’s sweetheart and Martha Stewart BFF would do this out of ill-will, so it must have been a mistake. We had some truly amazing entries this week. It was hard to choose a winner, and even more difficult to select the honorable mentions! I strongly suggest that you go look at the comments on the original post for a truly astounding number of solid jokes. Now for the honorable mentions! Mrichston has identified that monster Captain Toad and some sort of accomplice. Their rap sheet continues to grow! L1N0 shows the real evidence: it was all part of a cowardly robbery plot by that criminal Captain Toad. The story grows more complex. ...while PixelPete gives us the zoomed-out version. Urambo Tauro suggests that the burning of the tree had something to do with a jape of chairs. An amusement of seats? I’ll get there, I promise, it’s right on the tip of my tongue. Done With Kinja unites some big trees. Is this the end of Azeroth, though? Bob went for the double deep cut by making sure we know which Dark Lord is responsible for the delicious sips of cursed blood. Jagans also goes for the additional lore points. Someone’s getting slain today, yall! netsquire knows that the true meaning of friendship is...uh...well...can Pokemon do crimes? Bart Simpson is a scoundrel, as ababyseal points out. dermisgermis shows the obvious culprit. tjbena86 also goes for an obvious culprit. Rayman757 went back to the 90s to see who was really to blame. rogueIndy accurately identifies that Link, much like Captain Toad, is a total criminal. Eager100 says that this is fine. Ok?! I DID THE JOKE. I DID IT. HERE YOU GO. I MADE THE JOKE. Deododo forgot to include the happy wonderland dreamtime of sparkles that that Pyro would be seeing here. Iharm found the bad one. MilesTailsPrower found the most wholesome war crime. chillman88 closes us out today by holding the high ground.